Charming apartment on the second floor in the most ancient tower of a castle of the 11th century. Spacious and well furnished, comfortable and with beautiful views of the hills and the town of San Gimignano. Located at inside a wonderful ancient manor on the historic Via Francigena in an old medieval town on which stands the majestic castle. Situated in a large park with colorful trees, surrounded by vineyards and the beauty and quiet of Siena countryside. The charming and historic perfectly blends with the nature that surrounds him. Inside the park and the woods of the estate you can make trekking and mountain biking. A short distance away there is a riding school where you can practice horse riding. It is an ideal starting point to visit all of Tuscany and especially Siena, San Gimignano, Florence, Volterra. The farm of the Castle is renowned for the production of its excellent wines. A pleasant tasting product, a tour of the winery and a tour of the castle will be offered to all guests. 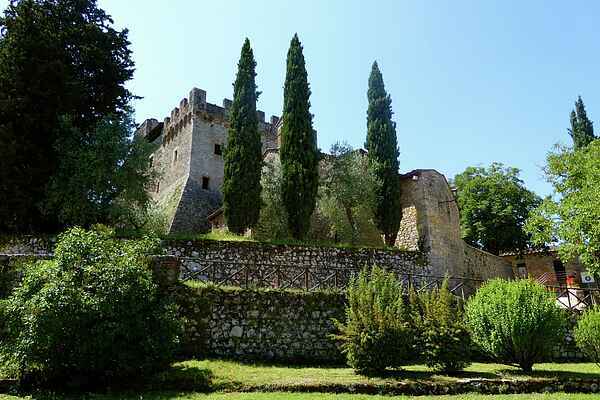 The Castel can be a starting point for traveling to the historic sites of Tuscany as well as a place to relax in the sun by the pool, or under a secular oak tasting a glass of wine from the farm.